It came as no surprise Apple killed the headphone jack in the iPhone 7 and iPhone 7 Plus. Months of leaks told us it would happen, and sure enough Apple sealed up the port to make more room for the phone's internals (oh, and something about courage). It also wasn't shocking for the company to come up with its own wireless solution to get around this self-inflicted problem, though I don't think anyone was truly prepared for AirPods. Whether for their design or price or clear desire to wind up missing, Apple's wireless headphones are drawing strong opinions. But like the loss of the headphone jack and AirPods or not, Apple gave us its vision for a wireless audio future this week, and in doing so, it took its biggest risks in recent memory. It's not the first phone maker to get rid of the headphone jack - just look at the Moto Z - nor the first to offer wireless headphones (see this list). But for Apple to be on the ground of the lose-the-jack movement this early is uncharacteristic of the company we've come to know in the past few years. As of late, Apple has been content to bide its time, letting others scramble to be first to a new service or technology before swooping in with its own take, one that's developed thanks in part by observing the efforts of others. It's often derided for being second or later to something, but it's a strategy that's worked for Apple. Cases in point: The Apple Watch, announced long after other smartwatches were on the market, and iWork, which just this week added real-time collaboration. Anyone who uses Google or Microsoft's productivity suites know how long they've enjoyed that feature already. That changed on Wednesday. Getting rid of the headphone jack on its flagship device and introducing wireless headphones that, on the surface, are so user unfriendly are risky moves we're not used to seeing from today's Apple. Apple's first big bet stems from the fact you have to buy AirPods separately. Apple made the decision to get rid of the headphone jack on the iPhone 7 and iPhone 7 Plus, now it's up to us to purchase the headphones that are truly meant to go with the phones. Hm. Of course, you can use the Lightning EarPods that come with the new iPhone, which may smooth over many users' transition woes. One hiccup with this is that you can't listen and charge your phone at the same time (though Belkin just announced a $40/£35/AU$60 solution). And if you want to use your own tethered headphones, you'll need a separate adapter. Apple is including one in the box, but if you lose it, you'll have to purchase a replacement. There's inherent inconvenience - a word not usually associated with Apple - for customers in all of this, from having to buy new headphones to using an adapter to changing the very way we can interact with our phones. Maybe it's a new reality we're ready for, but Apple is taking a chance in forcing us into it now. Granted, there's evidence we are ready and willing to embrace a headphone jack-less future. One major retailer has seen its wireless headphone sales skyrocket after the iPhone 7 announcement, as reported by TechRadar UK's Editor-in-Chief Patrick Goss. 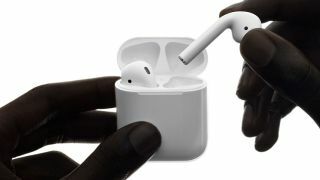 All the risk may pay off for Apple if more major hardware makers follow suit, eventually driving the price of AirPods down, or turning them into a free accessory that comes with every iPhone. And it's not as though Apple is throwing a half-baked pair of headphones into the wild. We found in our hands on AirPods review that the headphones have a magic to them, particularly when they activate on their own near an iPhone or automatically pause music when you take one out. They are, from our early look, a great answer to the missing headphone jack. Still, there are a number of potential problems when you get rid of that 3.5mm analog port and make it so that only headphones you approve work with your devices. The Verge's Nilay Pitel has a great piece exploring possible DRM repercussions, for one. But the big questions coming straight out of the iPhone 7 launch are how will customers respond with their wallets, and whether more electronic giants will follow the lead set by Apple - and a few others - in jettisoning the jack. Apple at least, for the first time in a while, is leading the charge, not sitting in the back seat.